Harsh Kasliwal Assistant Professor, Department of Anaesthesiology, R D Gardi Medical College Ujjain. Vipin Kumar Varshney Assistant Professor, Department of Anaesthesiology, Teerthanker Mahaveer Medical College Moradabad (U.P). M. M. Neema Professor & Head, Department of Anesthesiology, R.D. Gardi Medical College, Ujjain. Background: Modified Electroconvulsive therapy (MECT), is evidence based, safe and established treatment for varieties of psychiatric diseases that includes acute mania, major depressive disorder, schizophrenia, suicidal tendency and many more conditions. Government of India and world health organization has mandated use of sedative / anesthetic drug to make MECT acceptable method of treatment. MECT is administered under anesthesia to control acute cardiovascular, cerebrovascular and musculoskeletal changes occurring subsequent to delivery of electric current across the cerebral cortex. This also prevents respiratory and traumatic complications. 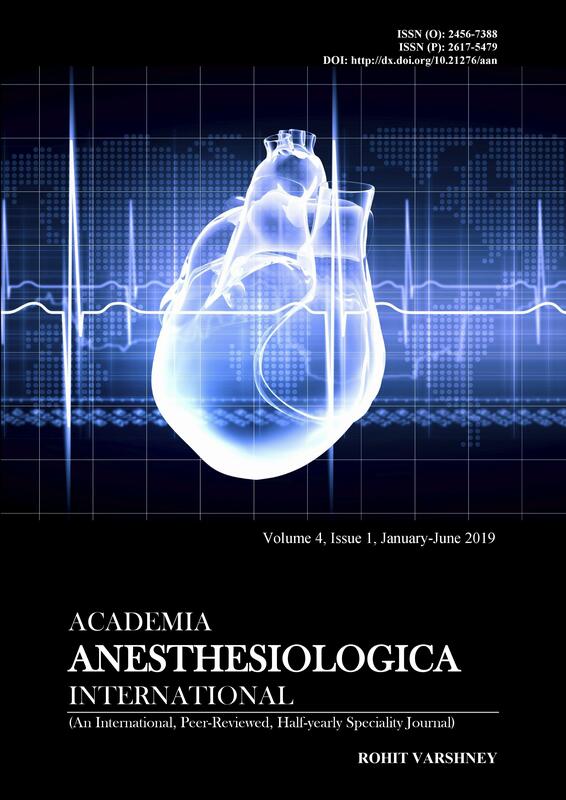 Subjects and Methods: In the present clinical observational study we analyzed 113 MECT administrations for evaluating suitability of thiopentone sodium, propofol and midazolam with succinyl choline chloride; on 45 patients belonging to ASA grade II with no associated systemic diseases. Results: We observed the induction characteristics, induction and recovery time, associated changes in hemodynamic parameters during and after procedure, duration and energy required to induce muscular convulsions and changes in serum potassium level. Our observations indicates that induction was quicker with propofol than with thiopentone 43.67 ± 9.13v/s 61.31 ± 15.58 seconds and recovery time was also quicker with propofol than thiopentone 518.73 ± 69.67 v/s 595.25 ± 112.68 seconds . Only on one occasion in thiopentone group induction was turbulent. Acute but short lasting changes in heart rate, systolic, diastolic and mean arterial pressure was observed in both thiopentone and propofol groups. The energy requirement was less than 100 joules on 34 sittings in thiopentone group while in propofol group it was observed on 47 sittings. In thiopentone group on 17 occasion energy required were more than 100 joules and 5 sittings in propofol group. There was transient elevation of mean serum potassium of 0.55 mEq/lit after MECT in all patients. Midazolam did not produce satisfactory condition in dose of 5 mg and needed thiopentone supplement on 10 occasions. Conclusion: The findings allowed us to conclude that both thiopentone and propofol along with sub-paralytic dose of succinyl choline chloride produced satisfactory conditions for MECT sittings without complications. However propofol provided quick induction and recovery and lesser energy requirement.